She’s the little girl in the picture. Kim Phuc was 9 years old on June 8, 1972, when her village, Trang Bang in South Vietnam, was bombed. 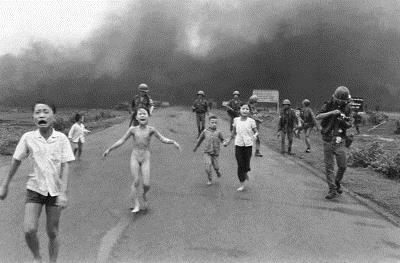 Burned by napalm, she ran down the road, screaming in fear and pain. Associated Press photographer Nick Ut captured all the war’s horror in this picture, which was published around the world and contributed to ending the conflict. Kim Phuc now lives in Canada with her husband and children. Her body still bears the visible and invisible scars of the napalm, but she has forgiven those responsible for her injuries. At a ceremony commemorating the Vietnam War in Washington several years ago, she told an audience of veterans that if she were face to face with the pilot who dropped the bomb, she would tell him, “We cannot change history, but at least we can try and do our best to promote peace.” John Plummer, one of those who coordinated the attack on Trang Bang, was in the audience. She opened her arms to him. Denise Chong: Despite your terrible injuries, you were able to forgive those responsible. How did you manage that? Kim Phuc: I was burned in 1972, when I was 9 years old. My house was in the middle of the place where four bombs fell. I received burns to 65 percent of my body and had to have grafts on 35 percent of my skin’s surface area. But my face and hands were unscathed. There were no scars, although those bombs could have destroyed me the way they destroyed friends and relatives. I dreamed of becoming a doctor and saving other people’s lives, like those who took care of me during the 14 long months I spent in the hospital. Then, after I came out of the hospital and despite the pain that would not go away, despite the wounds and terrible headaches, I wanted to pursue my studies at any cost. It was hard. My parents did not have enough money to buy medication for me, but my mother bought chunks of ice and put them on my head to relieve the pain, and my father put on ointments made of leaves known for their healing effects. Denise Chong: Did you pursue your studies? Kim Phuc: No. In 1982, I went through another very difficult ordeal. I had been admitted to Saigon Medical School. Unfortunately, one day the government realized I was the little girl in the picture and they came to get me to work with them, to use me as a symbol, and I didn’t want to. “Let me study,” I asked them. “I don’t want to do anything else.” So they automatically kept me out of school. It was awful. I didn’t understand: Why me? Why could my friends continue their studies and not me? I felt as though I had always been a victim. At 19, I no longer had any hope and wanted to die. Denise Chong: What changed things for you? Kim Phuc: I was brought up the traditional way, in the Cao Dai faith, which could be described as a blend of Confucianism, Taoism, Buddhism and Christianity. I prayed a lot. I spent my time reading up on religions. But nobody could ease my suffering. I doubted. Could God, if He exists, help me? One day in Saigon, a friend asked me to church. I had been like a starving soul, but it was hard for me to accept a new faith. What I wanted more than anything else was to make a friend, somebody to talk to, to confide in. I even drew such a friend on a piece of paper. One day, I walked into the church, and in the middle of the empty auditorium I saw a smiling girl. And she became my friend. Denise Chong: How did that meeting change your life? Kim Phuc: I felt better, but there was still this emptiness inside. It wasn’t until the day I found faith in myself that the burns in my heart were relieved. The government tore down the church in Saigon a little while later. The pastor left. Alone, I let the feeling of forgiveness grow in my heart until a great inner peace came over me. But that is not something that happens overnight. It’s not easy to love one’s enemies. I could have reacted with hatred and a desire for revenge. That would have been “normal,” but I chose to understand. That takes time. Denise Chong: You’ve been a United Nations Educational, Scientific and Cultural Organization goodwill ambassador since 1997. What is your message? How do you spread UNESCO’s ideals? Kim Phuc: I want my experience to serve a purpose. I was burned because of war. Today, I want to encourage people to love and help one another. We need to learn how to become more tolerant, how to look at the individual, to listen, to come out of ourselves, to help others instead of letting ourselves get carried away by anger and hatred, which give rise to revenge and violence in the world and don’t help anybody. War causes nothing but suffering. That’s why I show the little girl in the picture. Because she tells my story and the consequences war has had on my life. No father or mother in the world wants what happened in that picture to happen again. I would like to transmit what I have learned to value. That is the only way to save peace—to speak of tolerance and nonviolence. Denise Chong: Those are also the ideals UNESCO defends. But it’s not easy to forgive, especially in the context of war. Denise Chong: How else do you spread your message? Kim Phuc: The Kim Phuc Foundation was created in 1997. It helps children who are victims of war and violence. In East Timor, Romania and, most recently, Afghanistan, we give them medical, physical and psychological assistance, fit them out with prosthetic devices if they’ve lost a limb, help them get over the trauma they have gone through. I know how hard it is for those children to speak. My heart is with all the victims of the wars going on right now. For them, I have never stopped spreading a message of peace. The Vietnamese-born peace activist, now 52, is a living symbol of the suffering of innocent war victims. Her image of being burned by napalm during the Vietnam War raised worldwide awareness of the horrors of the war. Kim Phuc is now a bearer of the message of forgiveness, reconciliation, and tolerance. Here, she talks about the teachers in her life…. Excerpted from The Girl in the Picture: The Story of Kim Phuc, the Photograph, and the Vietnam War by Denise Chong (Viking Penguin, New York). Source: Unesco.org. Photograph from wikimedia.org.